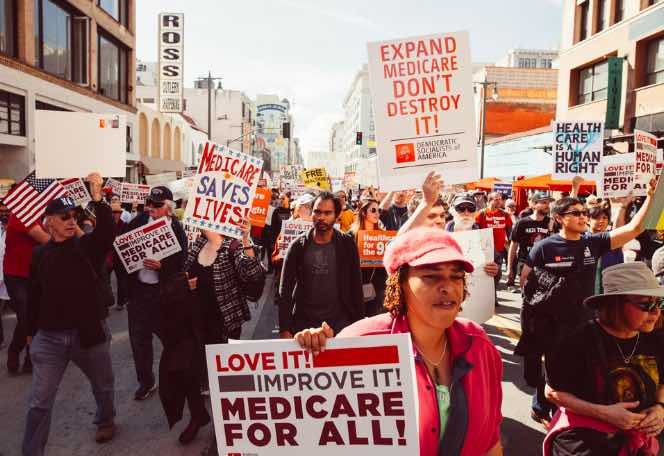 The Right-Wing Attack on Medicare-for-All - This Can't Be Happening! Rove’s biggest lie — one of omission primarily — is claiming that Medicare for All would cost over $3 trillion a year and massively increase taxes, without noting that at the same time, it would essentially eliminate private insurance premiums not just for employees, but for employers too, and that at the same time, it would also eliminate or replace programs like Medicaid, veterans care and hospital “charity” care (the latter which results in higher charges to insured patients and thus shows up as higher insurance premiums), since Medicare would be paying for everyone’s care. Another lie is claiming that it would be far too expensive to expand Medicare to cover five times as many people as it currently covers. But that’s simply not true. Firstly, in 2017 Medicare already, as it presently exists covering the disabled and those over age 65 cost $702 billion for the government (taxpayers) and another 50 billion paid as Part B payments by recipients (mostly deducted automatically from their Social Security benefit checks). Medicaid for the poor cost another $553 billion, and VA health care another $80 billion. That’s a total of nearly $1.5 trillion. So even using the inflated cost estimate in Charles Blahous’s Koch-bought research, Medicare for All could essentially double all those federal expenditures for healthcare, but instead of covering perhaps 60 million people, it would cover the entire national population of almost 330 million. Consider this. According to the Kaiser Family Foundation, people aged 80 and up represent 24% of the Medicare population, but they account for a whopping 33% of the program’s cost. In contrast, people aged 66-69 represent a slightly larger 26% of the Medicaid population, but only account for 15% of its cost — less than half what the oldest cohort cost for their care. Here’s another way of looking at it: Aside for infants, who all spend a short time in hospital unless they were born at home, hospital use and length of stay rise significantly the higher in age people are. For example, only 21 in 1000 children aged 1-17 need hospital care in a given year, vs. 79 per 1000 in the 18-44 age group, 109 per 1000 in the 45-64 age group and 261 per 1000 in the 65-84 age group. Furthermore, the days stayed (and the costs) per stay increase with age: 3.6 days/$9900 per stay for the 18-44 cohort, 4.9 days/$12,900 per stay for the 45-64 cohort and 5.2 days/$13,000 for the 65-84 cohort. Clearly, expanding Medicare on down to younger age cohorts, or all the way down to infants would be far cheaper than the added number covered might at first suggest. Now consider that the alternative for those currently not included in Medicare is to obtain increasingly costly private insurance coverage — paid for both out of their own paychecks, and through their employers, This option means huge premium payments, co-pays and out-of-pocket outlays for health care that such people would no longer be if covered by Medicare for All. How huge? Well, according to data from the federal Medical Expenditure Panel Survey for 2017, some 152 million Americans — workers and their families — receive their insurance through their employers. The average cost of that coverage, in terms of premiums and deductibles, was 12 percent of median income, and was typically higher for those earning lower incomes, and higher still in states where unions are less prevalent and wages are generally lower. Worse yet, the trend in recent years has been towards workers shouldering an increasing share of premiums, and being slammed with ever higher co-pays and deductibles. Over all, job-linked insurance coverage was found, in 2017, to cost an average of $7240 per employee, and substantially more for full family coverage. Typically, that study reports, employees pay only about 25% of the premium for their employer-based health insurance, with the employer paying 75% (usually the employee pays most of the cost for family coverage). Remember that since funds an employer pays for its workers’ insurance is money that could have otherwise been paid in higher wages or salaries, it’s all really ultimately coming out of the workers’ pockets. Since we don’t have a way to easily break down how many workers in each income category are paying for their insurance (but we do know that the quality of that insurance coverage is typically much worse the lower the income of the worker), it’s hard to put a figure on how much workers pay in aggregate for their employer-based coverage plus out of their own pockets, or how much employers pay in aggregate, but it’s clearly much more than $1.5 trillion a year, and much more than $15 trillion over 10 years. Like the government that is already paying $1.5 trillion to fund federal programs to pay for health care for the elderly, the poor and veterans, we US citizens are all paying considerably more than another $1.5 trillion in insurance premiums, co-pays and deductibles ourselves. Certainly it is true that Medicare for All would mean higher taxes, but the trade-off, which Rove and Republican (and conservative Democratic) opponents of such an approach conveniently and deliberately never mention, would be in everyone’s favor. Why? Because the increase in tax bills would be far less than the premium payments that we pay now and would no longer be paying. How can we know this? Because administrative costs, now eating up between 15-30 percent of the health care dollar, would go way down (Medicare’s administrative costs are and would continue to be minimal). And removing the profit motive from the system would also drastically reduce fraud, which the FBI reports currently adds up to as much as 25% of all US health expenditures. The reality is that the US, with its prevailing employer-based health insurance system, supplemented by very costly programs like Medicaid and the Veterans Administration to provide medical care for some of those outside that system, in total spends vastly more than in any other modern nation for health care. Whatever the state-funded or state-run health care system one looks at, whether it’s Canada’s single-payer system with the government as insurer and with private and public hospitals and private doctors delivering the care, or a nationally owned and operated system like the UK’s National Health where hospitals are government owned and doctors are government employees, or something in between, the total outlay on health care, both as a share of GDP and on a per capita basis is typically half of what it is in the US. Switzerland, where health care spending is $8000 per capita and 12.3% of GDP, has the second costliest health care system in the world, and significantly, is the only other developed economy that does not have a government-run insurance system. Instead it has a more centralized version of our complicated and totally inadequate Affordable Care Act system, where instead of a largely unregulated but partially subsidized “marketplace” for buying private insurance, the state tells its private insurance companies that if they want to sell lucrative “gold-plated” health policies to wealthier people, they have to offer, at no profit, a less fancy plan approved by the country’s parliament. And every citizen has to buy coverage or if they are poor, have it provided to them. Clearly, unless one believes that the supposedly “can-do” US — a country that can land men on the moon, build an orbiting space station and reliably deliver the mail in two days to anywhere in the nation — uniquely cannot do anything if it is run by the government, looking at the OECD statistics, a state-run medical system, however it is funded and structured, is more cost effective and better for a population’s overall health, than the greed plagued, profit-driven hodgepodge we have here. Rove claims Americans will turn against Medicare for All when they learn that it will mean they would not be able to retain their current employment-based health insurance. The truth though is that most Americans loathe their current private insurance with its cost, its co-pays, its deductibles, its frequent denials of coverage, its incomprehensible rules regarding pre-authorization for treatment and denials of coverage, not to mention all the paperwork required just to get reimbursed for expenditures, especially for treatment “out of network,” for example when visiting another state. And there’s also this: Republicans may say that socialized medicine is “slavery,” that it “removes choice,” and that it leads to “rationing of health care” and long waits for needed care. The problem with those charges is that all the developed, wealthy countries that have socialized health care are democracies–often much more real democracies than our own. And while it was usually socialist governments in those countries that introduced socialized medicine, most of them have had long periods since of conservative governments — often as in the UK, Canada, and some of the Nordic countries, pretty hard-line conservative governments, but not one of those governments ever dared to undo the socialized health care systems. Why? Because they knew how popular they were and that to frontally attack them would be political suicide. That should be all we need to know.